From what I’ve gathered, Austin-based Lightbox Interactive had two headlining goals when setting out to create a follow up to Warhawk: to further evolve the already excellent multiplayer-focused groundwork they’d already laid and to also add in a single-player campaign, which Warhawk lacked, in order to further flesh out the new title. While Starhawk offers some of the most satisfying online play I’ve experienced in recent memory, the quality level takes a bit of a nosedive when it comes to the campaign. When you first fire up the game, you’re greeted by the game’s protagonist, Emmett Graves. (Well, technically, you’re greeted with a 450 MB day-one patch and a 2 GB+ mandatory installation first…) Like Warhawk before it, Starhawk is a third-person shooter, complete with both ground and air vehicles. 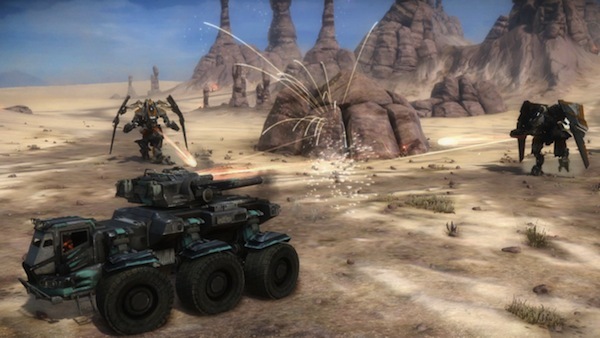 Unlike its predecessor, Starhawk features a full single-player campaign. The tale follows Emmett’s exploits as a rift salvager, a hired gun of sorts, cleaning up lucrative rift energy mining sites that have been overrun by Outcast, dangerous tribes of mutated former-humans. Cutscenes are implemented as animated comic panels (a la Infamous) and while this gameplay-comic-gameplay loop did pull me out of the experience a bit, it did at least eliminate any perceived loading screens between chapters. Between the space-western motif and the interesting character designs, the narrative first seemed promising, but ultimately ended up feeling like a squandered opportunity, hampered by stiff, underdeveloped characters and a paper-thin plot. 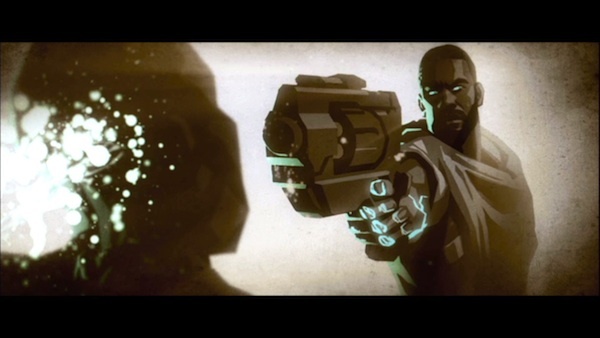 Occasional hiccups with dialogue audio – most notably some skipping during cutscenes – only further mar the overall experience.. Functionally speaking, it all ends up feeling mostly like an introductory tutorial wrapped in a story and although it fails to captivate, it does do a serviceable job of familiarizing players with the various weapons and vehicles found in the game. While battling it out on the ground, Emmett is able to call in building structures from his trusty sidekick Cutter, in orbit above the planet’s surface. This imaginatively named ‘build and battle’ mechanic carries over into the multiplayer modes and forms the crux of what makes the online multiplayer so successful. Rather than having vehicles and weapons spawn at set locations on the map, they’re all tied to in-game structures which can be laid down virtually anywhere that there’s space for them. Need a rocket launcher? Call in a supply depot. Need a jeep? Have a garage dropped onto the field. The sound design is spot on too, with structures plummeting to the ground and taking shape with appropriately chunky effects. 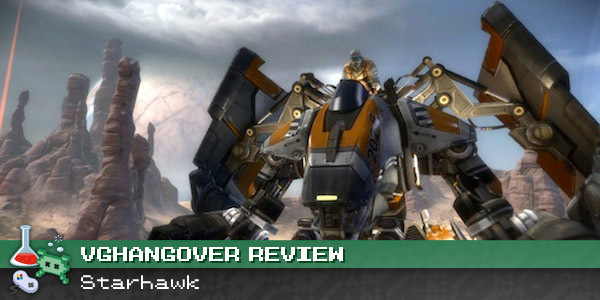 The ability to construct automated turrets and walls brings an almost tower defense-like element of strategy to Starhawk and makes for some immensely refreshing gameplay. To keep things from getting too crazy too fast, these structures all must be purchased using rift energy, which you only collect while you’re located within the boundaries of your base. An overall 32-building limit per team helps keep things in check as well. Even without a defined character class system, the various systems allow players to organically develop a role that jibes with their play style. Builder, defender, ace pilot, flag grabber; none of these are ratified roles, but they’re all options available to the player. A skills system further enhances this by giving players the ability to earn an augmentation that suits them. Skills must be unlocked by first completing a related objective. While some might feel that this means that better players are rewarded with bonuses that enhance their abilities, I find that the skill effects are so narrowly focused that they don’t dramatically alter the balance. LightBox has clearly put an immense amount of thought and care into balancing all these disparate elements and it absolutely shows. Hawks are devastatingly powerful, but easily defeated by a determined foot soldier with the right tools. An energy shield can be constructed around your valuable buildings, but it can also be swiftly destroyed by a tenacious hawk pilot. Aside from the tanks, which can occasionally feel a bit too powerful, everything else in Starhawk feels pretty well-balanced. Between their past track record with the community and how active they’ve been since the game’s launch, I’m confident that they will continue to improve the balance even more in the coming months. It’s also worth mentioning that they’ve already announced that all future map packs for the game will be free, in an effort to avoid splintering the user base. In today’s DLC-saturated market, you don’t see that kind of thing often and I commend their decision to do so. Though my time spent with Starhawk thus far has been overwhelmingly positive, I’d be remiss if I didn’t point out a couple of minor gripes. For one, there is a ton to learn in the game. Much of it came naturally to me, having played Warhawk in the past, but there are plenty of things that still weren’t well-explained. For example, the skills system requires that players complete a certain objective before they’re allowed to spend points and unlock a given skill. The descriptions of some of these objectives state that the player needs to earn a particular medal, but the definitions for these medals are nowhere to be found, as far as I could tell. I’m not a fan of the constant hand holding that’s often done in modern games, but pointing the player in the right direction a bit would be nice. While I found matches to be well-balanced much of the time (especially when teammates are communicating with headsets), it would be nice to be able to assign waypoints on the fly. There are on-screen indicators for things like flags and capture points, but it would be handy to be able to designate certain locations or structures with a user-defined indicator, especially for those players who aren’t making use of voice communication. 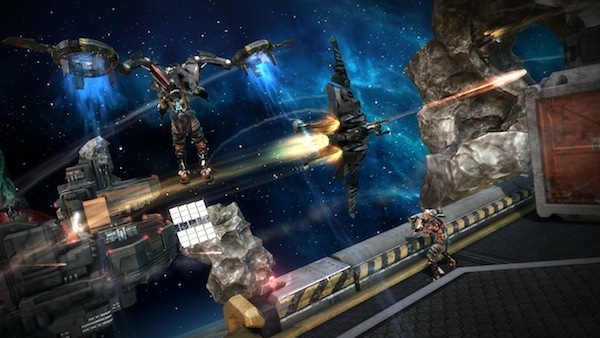 Starhawk features a co-op mode, where up to 4 players defend a rift mining rig from waves of enemies. I’m always up for a good horde-style co-op mode and I like Starhawk’s in theory, but in practice it was just far too difficult. I teamed up with 3 friends and gave it a shot, but after failing to pass even the second wave we decided to throw in the towel after the fifth or sixth failed attempt. Starhawk as a whole is a fantastic experience. Even with its subpar campaign and minor bugs, the positives outweigh the negatives by a mile. I may not have been enthralled with the campaign, but I’d rather have a mediocre one that none at all. It also serves as a welcome tutorial for multiplayer, where Starhawk truly excels. Very few games can rival the level excitement of playing on a full server, with teams battling out to take each other’s flags or gain control of zones. The unpredictability introduced by the build and battle system elevates what could have been just another team-based shooter into the marquee online experience of this year. * Jetbikes, jetpacks, hawks, oh my! 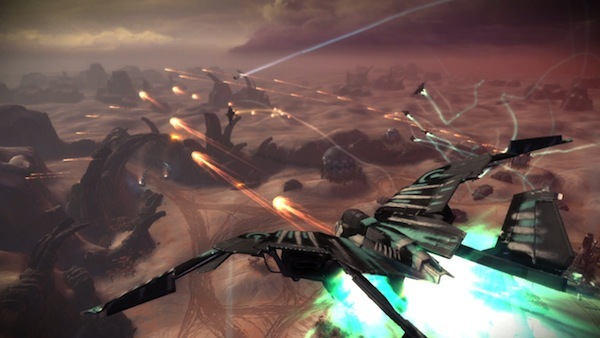 This review is based on a retail copy of Starhawk, provided to VGH by Sony. Previous Post VGHomework: Ready for Call of Duty: Black Ops II?